On-Site SEO is still important if you want to rank in the search engines and it’s one of the best things to check up on if you aren’t where you want to be ranking wise. Just making a few tweaks can make big improvements in your traffic levels. Lately, we’ve seen a huge resurgence of on-page SEO strategies, supported by numerous case-studies. Want to improve your rankings but aren’t sure where to start? Do you think improving your on-page SEO will take too much time? The title tag is the most important on-page SEO factor. Placing your focused keyword close to the beginning of your title tag will give it more weight in search engines. It is also recommended to add modifiers and long tails to rank for variations of your focused keyword. A good way to find long tails is to use kwfinder.com. You can go put in your main keyword and it will spit out all kinds of variations you can use in your article. You can also go through and update old posts with new titles. Nat Eliason was able to rank for a much higher search volume keyword just by tweaking his title tag. For a very long time, the standard length for meta-descriptions was 140-158 characters (924 pixels). Search Engine Journal recently reported that Google is experimenting with longer title and meta-description lengths. While this may only be a temporary change, it demonstrates just how important meta descriptions and titles are. SEO aside, meta-descriptions provide precious information to searchers, and they directly influence click-through-rates (CTRs). The meta description should include at least one of your most important keywords, quickly describe the contents of your page, and encourage users to visit your site. 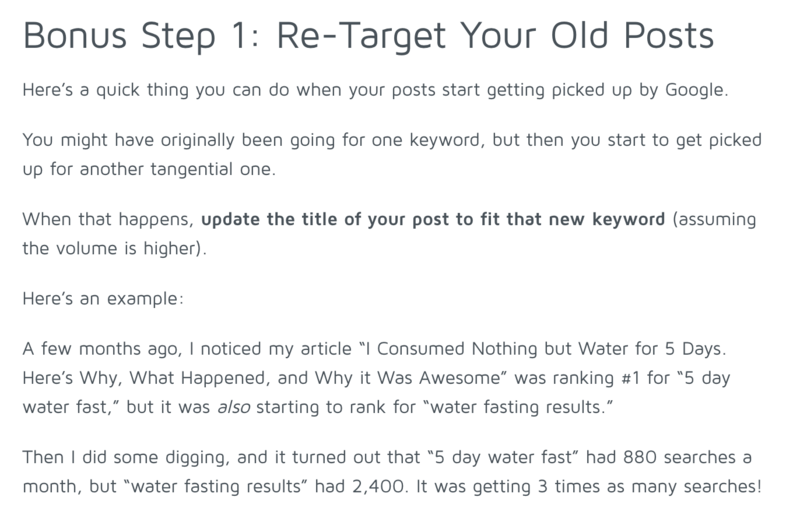 You can see how your snippet will look by implementing the Yoast SEO Plugin. Brian Dean of Backlinko advises us to drop the focused keyword in the first 100-150 words of an article or page. In other words, avoid writing long, dreary, and unclear introductions. Instead, insert your focused keyword right at the beginning of the page to let search-engines know what it’s about. Many experts claim that a website with stellar content can do well even without SEO. However, a site with amazing SEO will not survive without good content. This is why you should always create original, well-researched, meaty content. 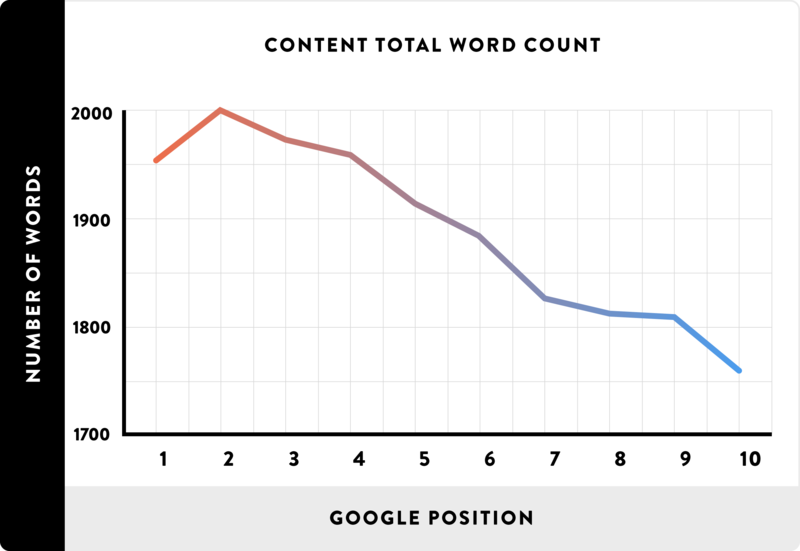 Studies have shown that longer articles have higher chances of ranking high in SERPs. In an age in which the attention span of the average human is less than three seconds, speed matters. Google has officially stated that page loading speed is an extremely important ranking signal. A site that takes more than 5-7 seconds to load isn’t only losing rankings, but also potential sales & leads. 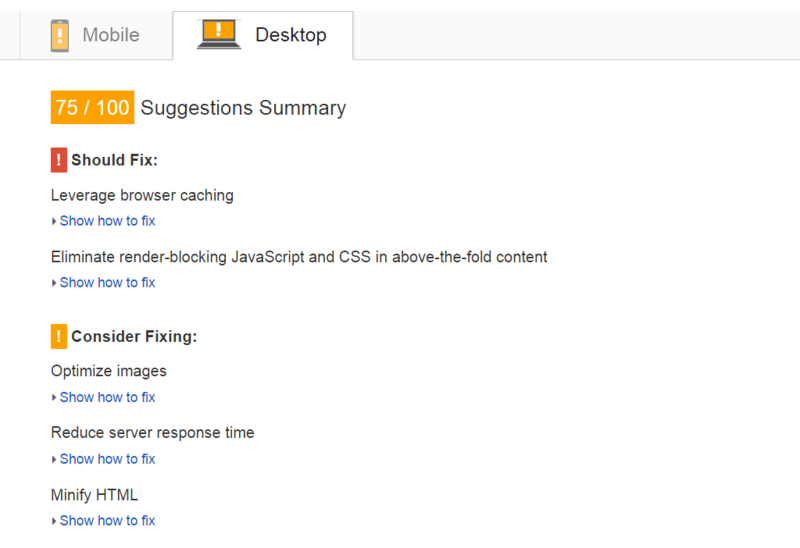 To help webmasters resolve page speed issues, Google has created a nifty tool, called PageSpeed Insights. Simply paste the URL that you want to check and the developer’s tool will pull-out information about it. Eliminate render-blocking CSS or JS in above-the-fold content. Another easy way to improve site speed is to use Cloudflare. Cloudflare can help reduce the time it takes for your page to load on average by 42%. Breadcrumbs improve user navigation on the site and help crawlers understand your data in a structured way. If your website contains many pages, breadcrumbs should be added to your pages (example: Home > Blog > SEO Strategy). Categories should be used to help search engines and users discover your content faster. You can also add sub-categories & sub-folders to segment your information even further, but we only recommend this for extremely complex sites. The HTML Sitemap is different from the XML sitemap. The HTML sitemap should appear on in the footer of your site and link to your most important pages. From an SEO perspective, the HTML sitemap is important because it distributes link-juice between the home-page and other pages. The ALT Text describes the contents of your image to search engines and represents yet another way for you to increase topical relevance. 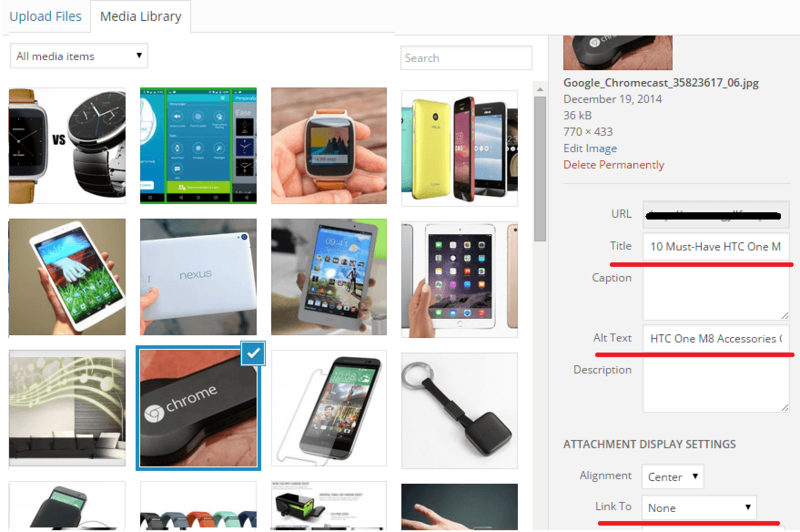 The Alt text of your image should contain an LSI keyword. The Image Title, which should be self-explanatory (e.g. “photo of a girl running on the beach”), can be edited before uploading the image on the site. The description. It is not mandatory to fill-out an image’s description, but doing so will increase your visibility on search engines. Important tip: Scale, compress, and rename your images before you upload them on your site to maximize site-speed and improve on-page SEO. You may also want to consider using CDNs for hosting your images. We were surprised to find out how many webmasters believe that internal links don’t matter. Placing links to other pages on your site represents an excellent method to improve user experience, navigability, and SEO. Interlinking will also help you disperse “page authority” and improve the crawlability of your pages. There are a number of ways for you to improve internal linking (including HTML sitemaps & bread-crumbs). Wikipedia makes great use of keyword-rich contextual links. A rule of thumb, when it comes to internal linking, would be to keep it simple: 2-5 links to relevant older posts/pages should be enough. Important tip: Perform regular audits of your site to discover broken internal links and replace/remove them. Broken links have a negative effect on SEO. Optimizing sites for user-experience can have a significant impact on your on-page SEO. Better experience means longer dwell time, lower bounce rate, and higher engagement. Google uses these metrics, which you can see in Google Analytics, to size up a page’s quality. You can increase the dwell time on your site & improve user experience by improving your content, removing unnecessary elements of your page, reducing load-time, adding powerful CTAs, etc. Always build sites with the visitor in mind, as their experience will directly reflect on your site’s metrics. By implementing these tricks you will be able to get more traffic with your SEO efforts. Do you have any other on-page tricks you’d like to share? Leave them in the comments! ← The HOTH Beach Party!